Avramidis, Konstantinos, and Myrto Tsilimpounidi, eds.Graffiti and Street Art: Reading, Writing and Representing the City. London and New York: Routledge, 2017. 281 pp. ISBN: 9781472473332. Gesturing towards the critical potentialities of an emergent field still largely “in search of academic legitimacy” (Ross et al. 2017), the essay collection Graffiti and Street Art: Reading, Writing and Representing the City, edited by architect Kostantinos Avramidis and sociologist Myrto Tsilimpounidi marks a timely intervention into the field of street art and graffiti scholarship. Comprised of fifteen contributions with disciplinary attachments to not just architecture and sociology, but also anthropology, urban geography, and criminology, the volume posits itself as “a testament to the multiple ways by which graffiti and street art have changed our ways of seeing, knowing and representing urban environments” (1). Crucially, the authors of the volume treat their objects of study—graffiti and street art—not as a static ontological field but rather as dynamic epistemological devices that allow them to examine the “poetic relationship between graffiti, social conditions, and public space” (3). In a similar manner, instead of imposing a set of framing definitions onto the reader, the editors allow multiple conceptual approaches to street art and graffiti to circulate throughout the volume alongside one another. It is precisely this strategic openness that makes Graffiti and Street Art such a productive and compelling resource. In their introduction, the editors map out with exceptional clarity what they consider a “critical turn in street art and graffiti scholarship,” tracing the development of the field through four distinct historical phases. The first wave of scholarship—preceded only by Jean Baudrillard’s exceptional 1976 essay “Kool Killer, or the Insurrection of Signs”—is inaugurated in the early 1980s by communication scholar Craig Castleman’s Getting Up: Subway Graffiti in New York. Castleman and other authors publishing during this first phase focused on describing the cultural phenomenon of graffiti as an “expression of dissatisfied youth” (19) as it had emerged in US-American cities in the late 1960s and early 1970s. During the second wave of graffiti scholarship, stretching from the early 1990s to the early 2000s, authors turned towards more nuanced questions of “what graffiti does, especially in relation to urban space” (19), while also steadily expanding the geographic scope of the field. Coinciding with the formation of street art as a genre, the third wave of scholarship brought forth a new commitment to context-considerate readings of both street art and graffiti. Authors also started to focus on the spatial politics of interventions into the visual landscape of the city in the context of the increasing militarization and commodification of public space. Graffiti and Street Art sees itself as part of a burgeoning fourth wave of graffiti and street art scholarship, aimed at destabilizing established ways of thinking, writing, and producing knowledge about how street art and graffiti function and circulate within complex and mobile material assemblages: “Prioritizing the visual, experiential and material along with the spatial and political, this volume aims to critically unpack the idiosyncrasies of our urban environments” (11). The volume assumes a three-fold structure organized around different modes of engaging urban space through street art and graffiti. 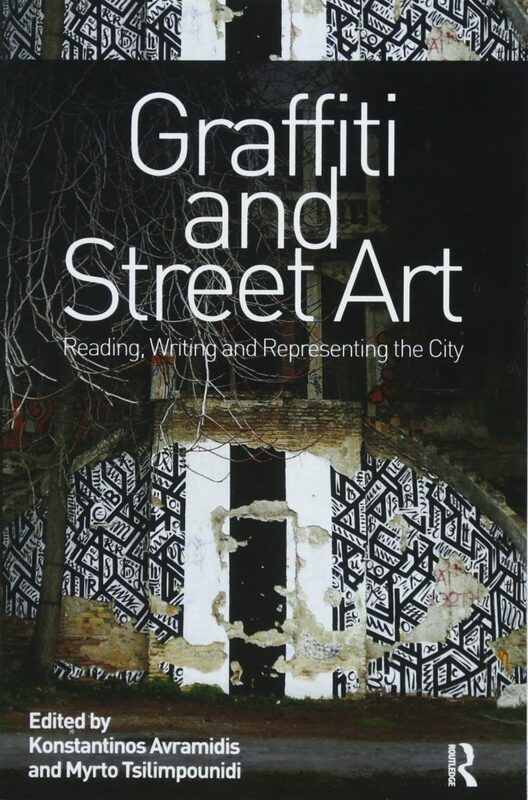 The first section, titled Reading Graffiti, Street Art and the City, compiles contributions that “map, and critically reflect upon, the reactions that graffiti and street art invite” (13). Among them are several compelling chapters written by established scholars in the field. Sociologist Jeff Ferrell, for instance, offers an account of the dialectical tensions that emerge from the contingent presence of street art and graffiti in the urban landscape, while criminologist Alison Young writes on the ambiguity surrounding legal conceptions of images in public space. Of particular interest is the contribution by urban geographer Kurt Iveson who prompts readers to rethink their assumptions about the relationship between authority and democracy vis-à-vis graffiti and street art. Self-authorized interventions into public space may be politically transgressive, but not always automatically transformative in a meaningful sense. He writes: “it is one thing to transgress the order of the city—it is another thing again to transform that order” (92). The most engaging entry in this section, however, comes from London-based architectural historian Sabina Andron, still a Ph.D. candidate at the time of writing her contribution. Her piece “Interviewing Walls: Towards a Method of Hybrid Surface Inscriptions” is distinctly inventive in that it introduces not only the new conceptual approach of hybrid surface inscriptions but also offers a corresponding methodology of photographic annotation. 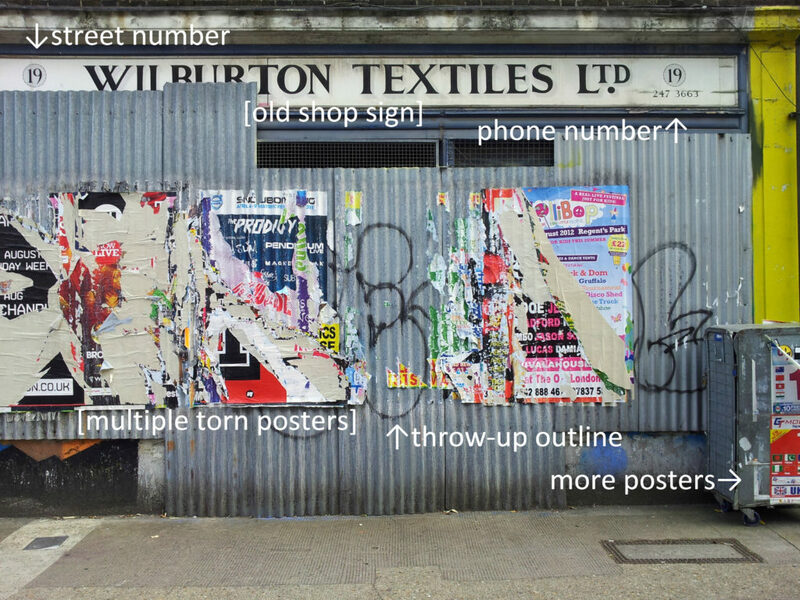 The term hybrid surface inscriptions is grounded in an approach that considers the totality of signs in public space—street art and graffiti, but also advertisement, as well as commercial and public signage—as “clusters of communication” (71) that form “complex urban palimpsests” (86). The potentials of reading the city through its hybrid surface inscriptions become particularly clear in the annotated photographs that accompany the piece, all of which were taken by the author in London (Figure 1). A kind of map of the city walls, these images illustrate how “[e]ach sign proves that a particular place is alive and inhabited, transforming surfaces into vigorous social spaces in contemporary cities” (81). The volume’s final section Representing Graffiti, Street Art and the City, examines “how, why, and with what impact graffiti, street art and the city are represented in media” (16). Spanning a broad range of approaches and contexts, the section includes two empirical case studies—one set in São Paulo, one in Ottawa—as well as a chapter devoted to a literary study, focusing on Arturo Pérez-Revertes El francotirador paciente [The Patient Sniper], a novel devoted to the fictional graffiti writer SNIPER emerging out of the streets of Madrid. Alongside them is a most notable piece by Lachlan MacDowall. Titled “#Instafame: Aesthetics, Audiences, Data” it traces the aesthetic and political implications of graffiti and street art’s current shift towards digitally mediated circuits of circulation and encounter. As artists have come to seek and achieve fame—graffiti lingo for (peer) recognition—increasingly through social network interfaces, MacDowall urges researchers of contemporary graffiti and street art to recalibrate their notion of “the street” accordingly, treating it as both a “backdrop for the production of digital content and a site of globally connected political action” (232). Moving from the conceptual towards the empirical, he goes on to analyze a specific dataset consisting of the 100 most followed graffiti and street art accounts on the popular photo-sharing platform Instagram, assembled and coded manually by the author. Analyzing the distribution of formal attachments, gender, and other aspects, MacDowall demonstrates how the configuration of contemporary street art and graffiti cultures is reflected and shaped by the platform. This account of what is ostensibly the future direction of both the study and practice of graffiti and street art would have made for a meaningful closing chapter for the volume. Instead, the editors reserve the last pages of the book for a contribution that turns towards a historical point of origin: “one of the most enduring and least understood aspects of graffiti writing, namely the tag” (265). Sociologist Gregory J. Snyder makes a persuasive argument to recuperate the tag from its marginalized position within graffiti and street art scholarship, and to foster an appreciation for its innovative and aesthetic capacities. “Long live the Tag” (272), the last sentence of the book, stands as a testament to the editors’ deep commitment to a lateral engagement with graffiti and street art, as well as a careful decentering of teleological narratives, hegemonic discourses, and regimes of knowledge production—contours of the critical futures of the field. Ross, Jeffrey Ian, Peter Bengtsen, John F. Lennon, Susan Phillips, and Jacqueline Z. Wilson. “In search of academic legitimacy: The current state of scholarship on graffiti and street art.” The Social Science Journal 54 (2017): 411-19.